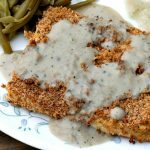 Having lived in the great state of Texas, I got to know Chicken Fried Steak intimately…….specifically, from a fast food joint called Grandys. 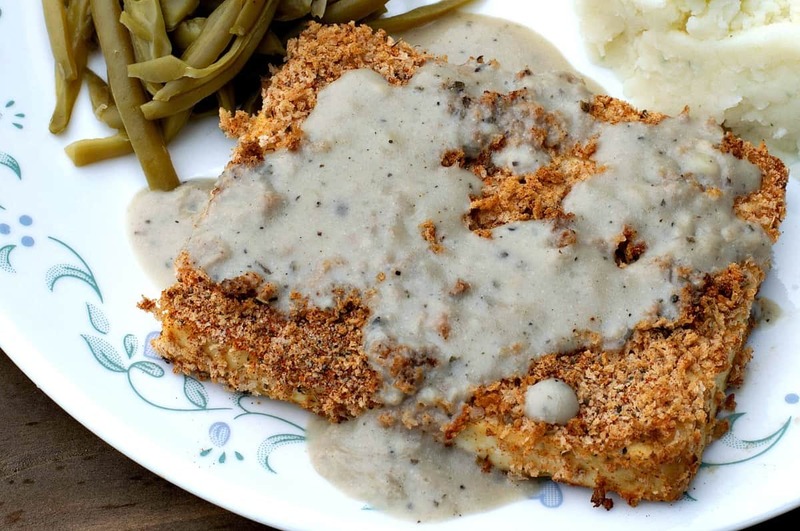 I mean Chicken Fried Steak to go? Be still my heart. So in an effort to recreate that Texan comfort food I once loved, I made this Chicken Fried Tofu. And oh boy howdy y’all, is it ever good! There’s just something about that chewy, deep-fried goodness, especially with that flavorful breading and all smothered in gravy…. MAN was that good stuff. Yes, even as a converted meat-eater I still miss this kind of food too. I mean it was comfort food! And I think that is one of the main reasons so many new folks fail when they try to make the switch to plant-based…. They miss their favorite comfort foods! And something like this? Deep fried steak? This would normally be completely out of the question! What if we took something else besides meat, like breaded TOFU and baked it instead? Extra-firm Tofu, dipped in a flavorful batter and dredged in those 11 secret herbs & spices, baked to a crispy perfection… Would it taste just as good? Well, I’m here to tell you YES! This was PERECT , even BETTER than what I remembered. And the best part? If this recipe helps just ONE person stay on track, then I will have succeeded. Recreating those comfort foods we loved, so you don’t feel like you’re missing a thing. 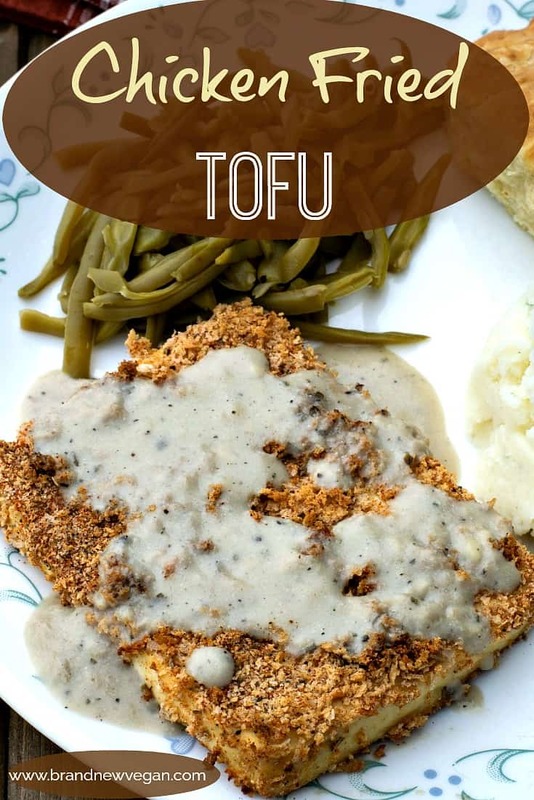 So with that said, let’s make some Chicken Fried…..
Start with a 14oz package of Organic, Extra-Firm Tofu. Make a slit in the package and drain all the water out, then lay the block on a cutting board. We’re going to cut this into 3 equally thick slabs, about ½” thick. Lay these on a kitchen towel or paper towels, cover them with more toweling, and then place something heavy like another cutting board on top. I go as far as to put something even heavier on top of the cutting board. The idea is to press as much water out of the Tofu Steaks as possible (this makes them chewier). Let them sit for a good 20 minutes or more, changing the paper toweling out every 10 minutes or so. Next, let’s prepare the batter and breading. Since this part is exactly like my Kentucky Fried Cauliflower recipe, I’ll just copy and paste those instructions here. Combine the Panko, and all the dry breading ingredients together in a small bowl. Whisk thoroughly and then pour this into a flat, shallow pan we can use for dredging. We’re going to whisk ¼ cup of flour, the nutritional yeast, sage, salt, pepper, and thyme together in a small bowl and pour this into a large frying pan. We want to toast the flour and spices just slightly (1 min or so) before slowly whisking in 3 cups of Unsweetened Almond Milk. Simmer over med-low heat, stirring often, until it thickens to a gravy-like consistency (it will thicken even more when it cools). Whisk ½ cup of chickpea flour (or regular flour), the onion powder, salt, and pepper in a small bowl. Meanwhile, whisk 2 tsp of either lemon juice or apple cider vinegar together with 1 cup of unsweetened almond milk to make the ‘buttermilk’. Pour the wet ingredients into the dry and mix to make a thin, pancake-like batter (it should not be thick). Pour this into another flat, shallow pan and let’s start dipping. By now our Tofu should be nice and dry. For the actual dredging process, professional chefs will use what is known as the “wet/dry hand” method here. What that means is, they will use one hand to place the Tofu into the wet batter. I used a pastry brush to make sure the Tofu was evenly coated without handling it too much. Then with that same wet hand, I gently placed it into the breading. Then with my other (dry) hand, I gently spooned the breadcrumbs over it evenly until it was thoroughly coated. For the baking pan, I used a normal cookie sheet with a cooling rack placed on top. This allows the Tofu to cook evenly without having to flip or turn. 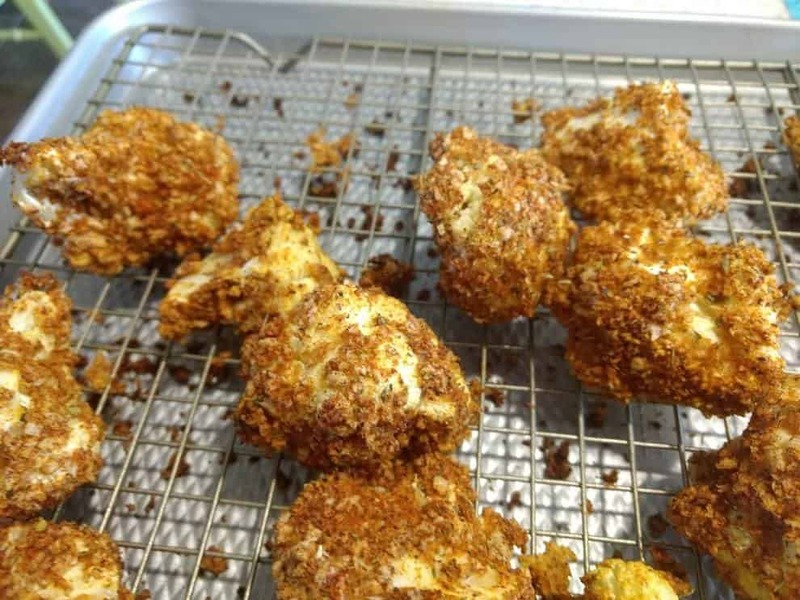 Here is a photo sent in by one of my readers showing the same method she used to make my Kentucky Fried Cauliflower. Thanks for the idea Pam! So once our Tofu is battered and breaded, gently place them on the pan. We’re going to bake them in a regular oven at 400° F. Check often and remove when they are brown and crispy, about 30 minutes. Here are some alternative ways of using this recipe that may be helpful. Convection: If you have a convection oven, the cooking time will probably be less. Check often. Air Fryer: If you have an air fryer – I’m not sure my little 3 qt Air Fryer would have room for 3 Tofu steaks without touching. If you want to experiment by making smaller pieces, go for it. I would say check them frequently and give them a little shake from time to time. Tofu: In addition to the Tofu, I also use this same process to batter and bread 3 large Cauliflower Steaks. I basically removed the leaves and stem of a large head of Cauliflower and then sliced it into 3 large, 1″ thick slices. It was good, but cutting the Cauliflower into steaks was a messy process and I lost a lot of it as it crumbled into smaller florets. Well, gang – that’s about it for this week. Please let me know how you like my Chicken Fried Tofu, and as always, keep those comments coming. 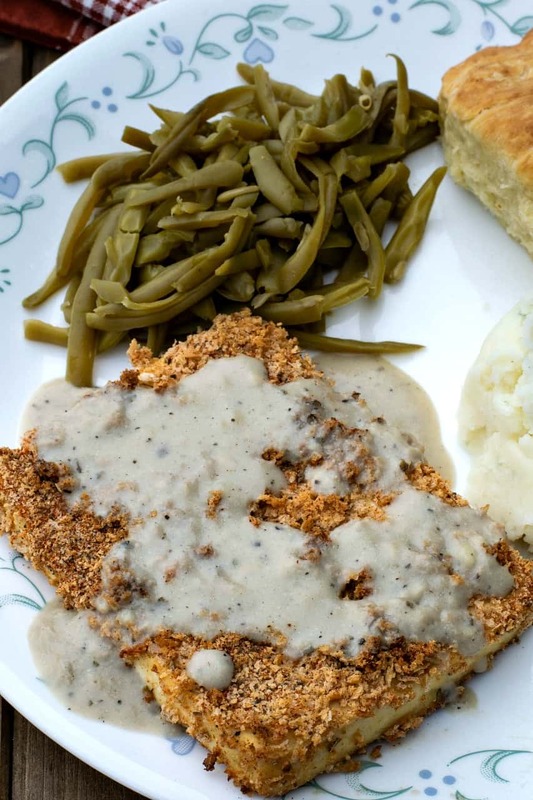 Having lived in Texas, I got to know Chicken Fried Steak intimately.... specifically from a fast-food joint called Grandys. So in an effort to recreate that Texan comfort food I loved, I made this Chicken Fried Tofu. And oh man y'all - it IS good! Wrap the Tofu Steaks in paper towels and place something heavy on top to press out as much moisture as possible. Press and drain for at least 20 minutes, changing paper towels as needed. Whisk all dry ingredients together in a bowl, then spread evenly in a flat, shallow pan for dredging. Set aside. Whisk all dry gravy ingredients together and then pour into a large skillet. Toast dry ingredients for 1-2 minutes over med-low heat, then slowly stir in 3 cups of almond milk. Whisk to remove any lumps and stir often as it begins to thicken. Whisk all dry ingredients together in a small bowl. Also, whisk either lemon juice or vinegar into almond milk to make the 'buttermilk'. Pour into the dry ingredients and mix until smooth. Pour batter into a flat, shallow pan. Preheat oven to 400 degrees F and place a wire cooling rack on top of a baking sheet. With one hand place a Tofu Steak into the batter. Brush batter evenly to make sure it's evenly coated. With the same wet hand, place the battered Tofu into the breading. Using your other (dry) hand, spoon or scoop the breadcrumbs evenly over the Tofu until evenly coated. Place Tofu Steak on pan. Bake at 400 degrees F until brown and crispy, about 30 minutes. 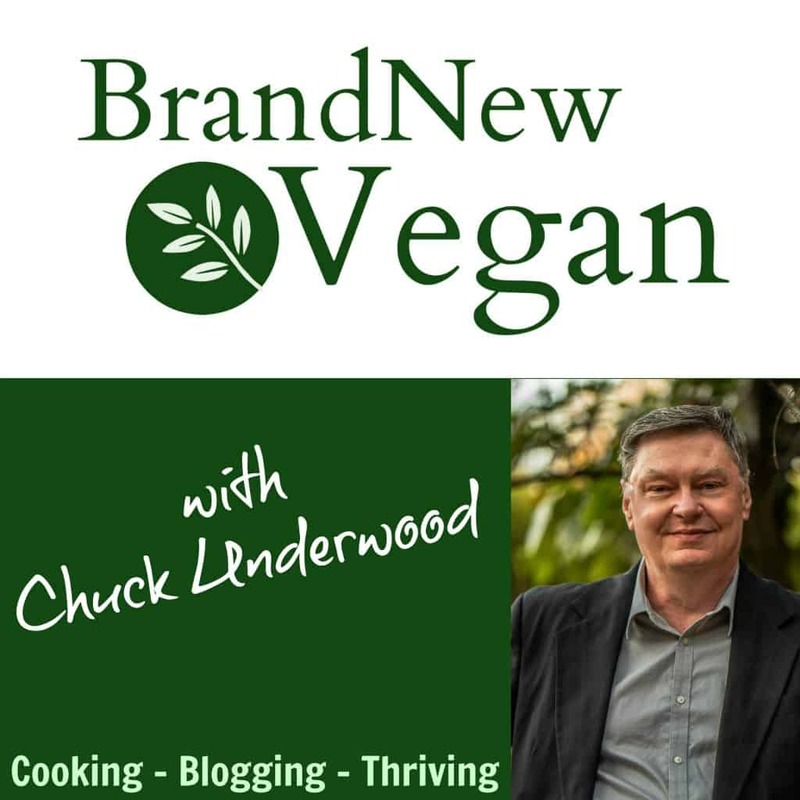 Previous Post: « BNV006: What About Protein? It doesn’t mean the recipe was bad – it just means you didn’t like it. And that’s ok if you don’t. I personally loved it as I’m sure other’s will too. I wanted to give my review, since the only other one is negative. My family thought this was amazing. I’m not a huge fan of tofu. We’re split down the middle in the family with 2 that like it and 2 that do now; however, we all agreed that this needs to be added to our weekly line-up. I did make one modification on the breading, since I did not have the celery seed, white pepper and ground ginger. I used 2 teaspoons of Trader Joe’s 21 spice salute and added the paprika, ground mustard, salt and pepper. Otherwise, I followed it to the letter. I really like it! It had a lot more flavor then any recipe I have had. Im really impressed! This was really a great subisitute. Hi! I just found your recipe on Pinterest and gave it a try. It is delicious! Thanks for sharing and I will definitely make it again. I loved it! and the gravy is my go to when I want biscuits and gravy! This was amazing. I made mine in the air fryer at 200 C for 15 minutes. I followed the recipe to a T. The tofu breading is OK, but the bread crumbs don’t much stick and overall it remained very bland. It didn’t help either that even after over an hour, the gravy was thicker but no where near thick and it didn’t taste flavorful at all. I gave up and used a spicy mayo sauce on the tofu (now cold) instead to actually have some flavor. I was very disappointed how this didn’t turn out and the waste of so much almond milk.